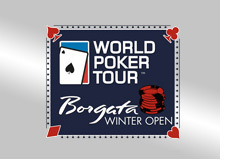 The extremely popular Borgata Winter Open has kicked off in Atlantic City and will run until the main event finishes up on January 31st. If early numbers are any indication, this event will easily top last year's event in terms of total player numbers. The first event, a $300 + $50 No Limit Hold'em tournament, had 1649 people take part, making for a total prize pool of $494k. Justin Peckholdt took down the first event after a three-way chop, with Justin receiving first-place money of $93,152 plus the watch, and Alex Cukar and Joe Fleming finishing second and third. According to the Borgata blog, Cukar and Fleming decided to move $7k from second to third place in order to facilitate the chop. The Borgata event is off to a good start, with a field of almost 1700 players taking part in the first event. Last year the main event was won by John Hennigan, who bested Chuck Kelley in heads-up action and took down the first place prize of $1.6 million dollars. You might remember the final hand of the tournament last year as it was an unusual one. Kelley held Q7, and Hennigan held A5. The board read 7 3 3 A and Kelley flipped over his cards mistakenly, thinking that the river card had already been dealt. There was actually one card to go, which was the three of hearts, giving both players a full house. Hennigan pushed, knowing that he was ahead of Kelley because Kelley had exposed his cards. Kelley thought for a bit and eventually called, believing that Hennigan was bluffing. Hennigan obviously wasn't, and he took down the tournament. The main event is going to be absolutely loaded with talent this year, and we'll be following the event closely.